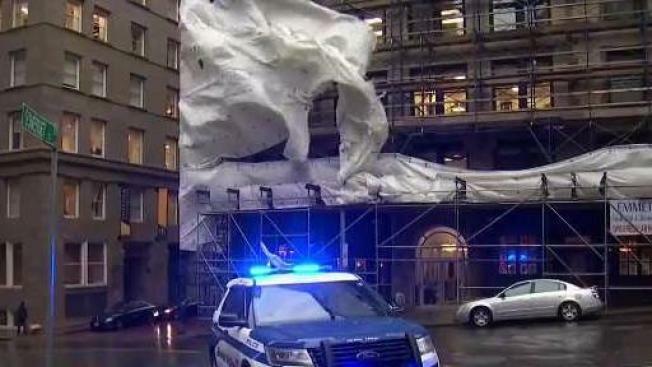 Wind damage reports have been coming in across New England, including part of a high-rise being ripped from a building in Boston. The first day of day of winter brought soaking rain and warm temperatures, eliminating snow in New England and dashing hopes for a white Christmas for millions. Mark Bloomer from the National Weather Service said some parts of Maine would see more than 2 inches of rain Friday, along with temperatures topping 50 degrees in many places. It reached a record high of 62 degrees in Concord, New Hampshire. Winds were gusting to 55 mph on the coast. Flood watches were issued for parts of Maine, New Hampshire, and Vermont. Rain and snowmelt could push rivers over their banks. The rain will give way to sunny skies in some areas on Saturday, but cooler temperature won't return on Sunday. The stormy weather left damage in parts of the region. In Boston, part of Boylston Street was closed when the wind blew debris off a building. At Logan International Airport, hundreds of flights were delayed or cancelled due to weather. Trees and power lines came down in other Massachusetts communities, as well.